I love waking up on a Saturday. It’s a day fat with possibilities and the first possibility I think of is breakfast. Whereas in the week breakfast is a hurried and standing affair, at the weekend I can sit down and enjoy it. And often it turns into a two-stage process: something fruity with tea then something more substantial with coffee, like pan con tomate, or bacon and egg at brunchtime. My current favourite for the first stage is granola. I first discovered this in the States, at a place called the Big Sky Bakery in Baltimore, and I became quite obsessed with buying bags of the stuff to eat as a snack. (By the end of my two years there I had gained ten kilos which was no surprise…) And then I forgot about it until last year when I came across a Bill Granger recipe for granola with roasted plums and yogurt. I serve it to everyone who comes to stay now, and my sister’s children still talk about it being the ‘best breakfast ever’. 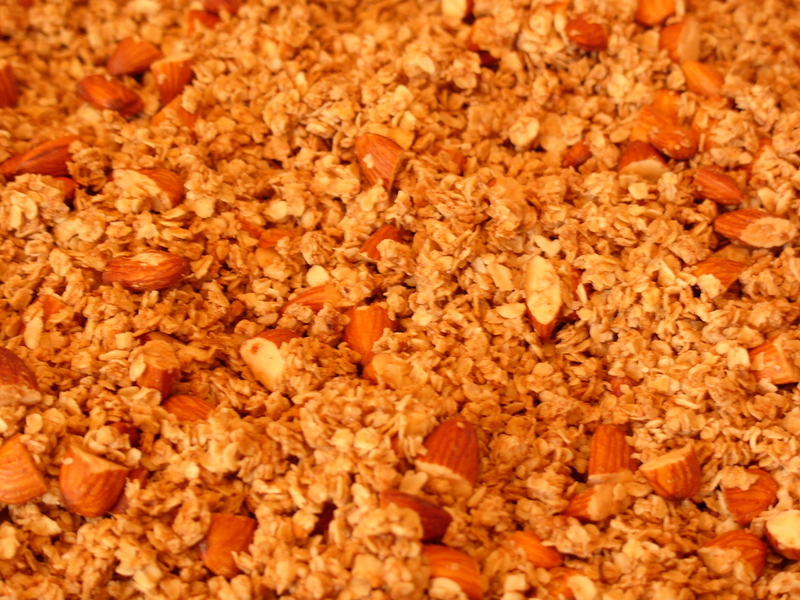 I rarely bother with roasting fruit just for myself, but I do make the granola every week. It’s really easy and it makes waking up for the rest of the week just that little bit more bearable. 1. Preheat the oven to 150C/gas 2. 3. Put the butter, sugar and cinnamon in a large saucepan (you’ll be mixing all the ingredients in it, so big enough for the oats and nuts too). 4. 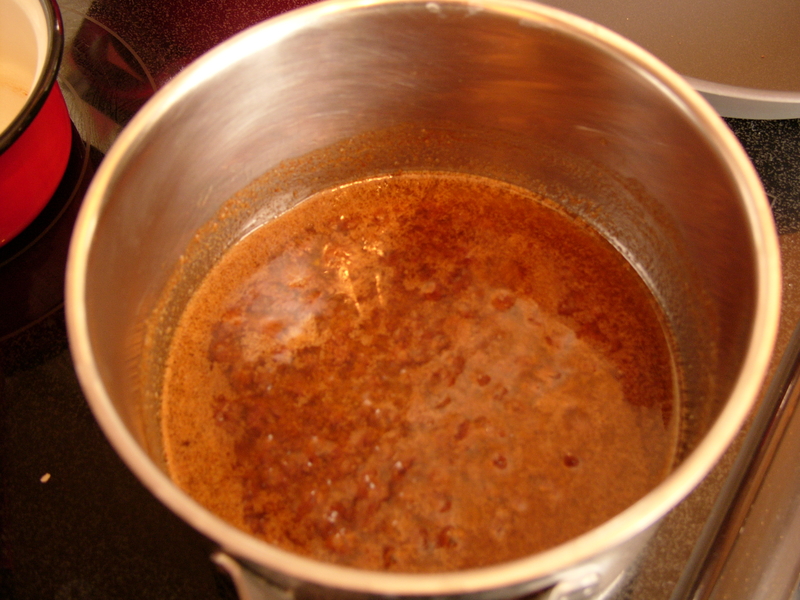 Place the saucepan over a low heat, and stir the butter, sugar and cinnamon until the butter has melted and the sugar has dissolved. 5. 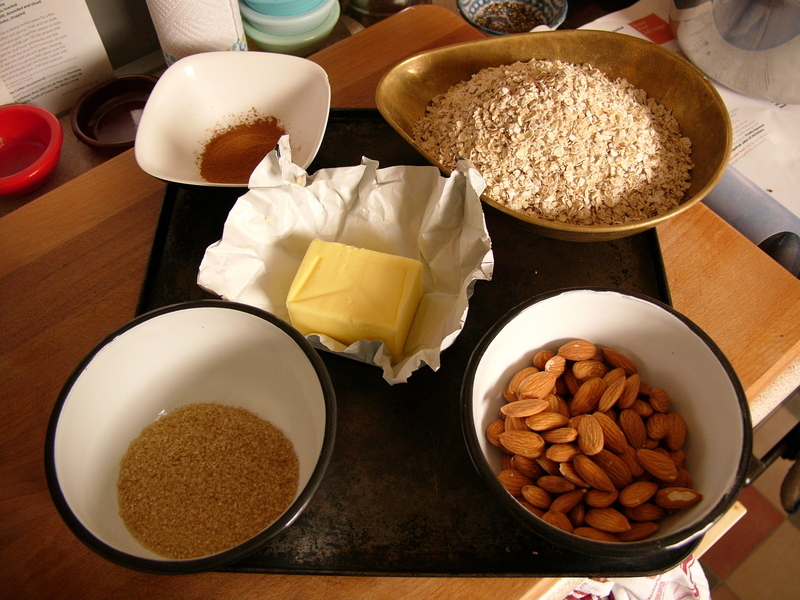 Take the pan off the heat, add the oats and nuts to the pan and stir until evenly coated with the butter-sugar mixture. 6. 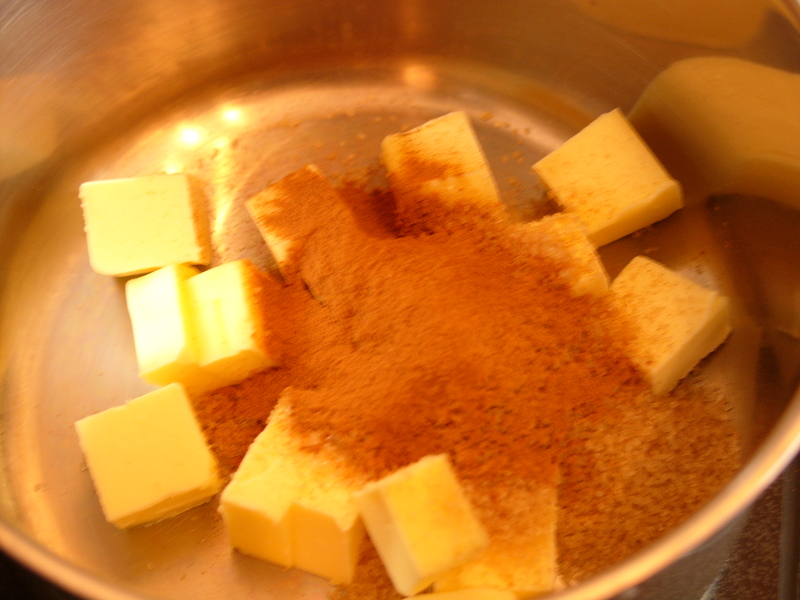 Spread the mixture evenly on the baking tray, in a thin layer. 7. Bake for about 30 minutes until lightly browned. 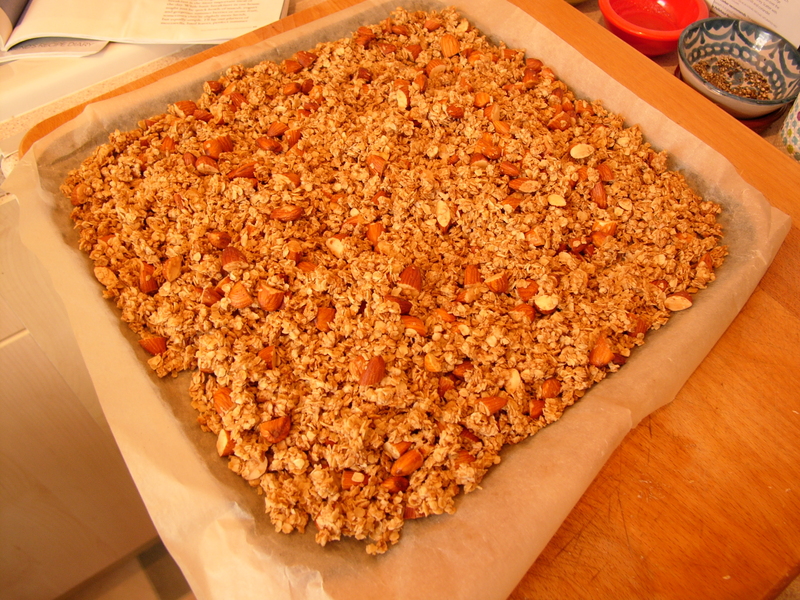 (I tend to take the tray out of the oven after 15 minutes and turn the granola over a bit before putting it back so that it browns all over). This entry was posted in Bill Granger, Breakfast, Cookery writers, Saturday breakfast, Sunday Breakfast. Bookmark the permalink. I am going to try this soon. 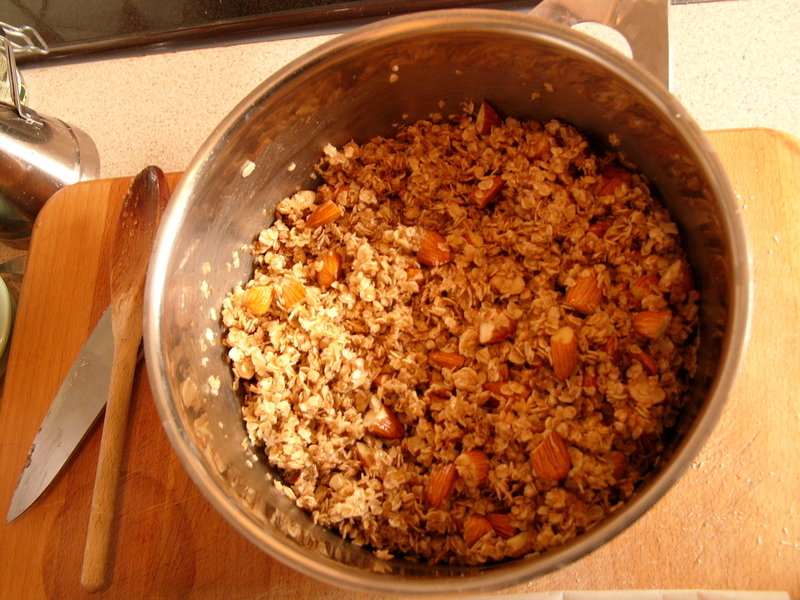 I usually make a Bill Grainger cereal from “Bill’s Sydney food” which is “rolled” oats, pumpkin and sunflower seeds, rye flakes, coconut flakes coated in a blend of butter, honey and vanilla essence roasted for about 30-40 minutes, then cooled and mixed with chopped fruit (at the moment I have dried apricots). its substantial and I usually have it with milk and I usually make a tubful which lasts about a month. I love his concentration on breakfast as a meal to be celebrated. I was given my first Bill Grainger book as a flat warming present and we often use him both for breakfast and supper recipes. Are you bringing some to France then?! Sounds fab.